If you wonder what to use to get more attention, use good design concept. This is the very starting point that is of the previous importance for creating the successful online project. Each element of this design should be thought-out to make your project user-friendly and appealing for its future visitors. We are glad to present you the following Joomla! 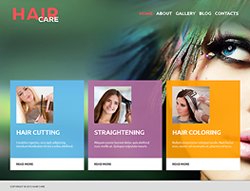 Website Template for Hair Salon that you are welcome to use as the ready-made solution for your web presence. The name of this template completely suits its content. The design really looks fresh and unusual. Gorgeous male and female photos capture visitors' eyes.